Everyone you meet will form opinions based on what you say and write. That’s why I’m so excited to announce my new book, Write & Speak Like a Professional: Success in 20 Minutes a Day. Strong written and spoken communication skills are crucial to opening doors. Millennial Branding’s research showed soft skills topped the list of “must have” skills that employers want, with 98 percent of employers saying communication skills are essential. It’s up to you to make the most of every opportunity to prove you’re capable and confident. It’s no secret first impressions matter – that’s been the case since the beginning of time. What’s new, in our increasingly fast-paced, digitally connected world, is how a simple stroke of a keyboard, or an email gone awry, can quickly damage a professional reputation. On the other hand, a stream of consistent, well-written social media updates can just as easily raise your profile and impress people you’ve never met who may positively influence your career. As a job search coach and social media strategist experienced at helping job seekers and business owners market themselves online and in person, it’s clear the most successful professionals try to improve their communication skills at every opportunity. Whether your focus is networking, job search, or excelling at work, it’s more important now than ever to know how to present yourself in person and in writing in this hyper-competitive work environment. 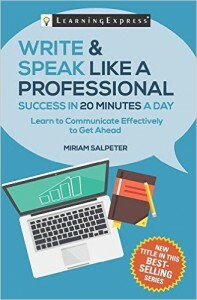 Write & Speak Like a Professional: Success in 20 Minutes a Day provides instructions and exercises to improve your communication abilities and offers insights and ideas to help refine your skills in every aspect of your job or career. It includes instruction on everything from networking to resume writing and interviewing. Communication skills are just as important in the workplace as they are when looking for a job, so you’ll also find details about how to impress people at work and how to write clear, concise business emails that will get the best results. With attention spans growing shorter, it’s never been more important to learn how to hone in on your message and eliminate non-crucial details. This book helps you recognize if you’re missing opportunities to communicate succinctly and demonstrates how to remedy any problems. Whether you’re attending a meeting, or writing a memo, it’s up to you to put your best foot forward. This book provides the resources to help you identify any deficiencies or problems you may not have considered. Are you using words in your emails that call your professionalism into question? Does the tone or inflection of your voice make people think you aren’t confident? Could you be doing more via social media to expand your reach and extend your influence in your professional community? Does your body language send the message you want people to receive? Read this book to learn how to improve your ability to make a strong first impression, and how to extend and enhance that impression so your colleagues and supervisors will listen carefully when you speak and appreciate what you write. Click here to download a free chapter from the book : Communicate Using Social Media. Be sure to touch base to let me know what questions you have!